Stars Over Washington: Feb 24, 2017: Hitler's Progressed New Moon exact! Feb 24, 2017: Hitler's Progressed New Moon exact! Is It Fair to Compare Trump to Hitler? 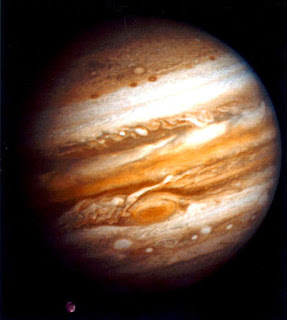 As you know, a Secondary Progressed New Moon phase indicates a new cycle of activity for those who live. 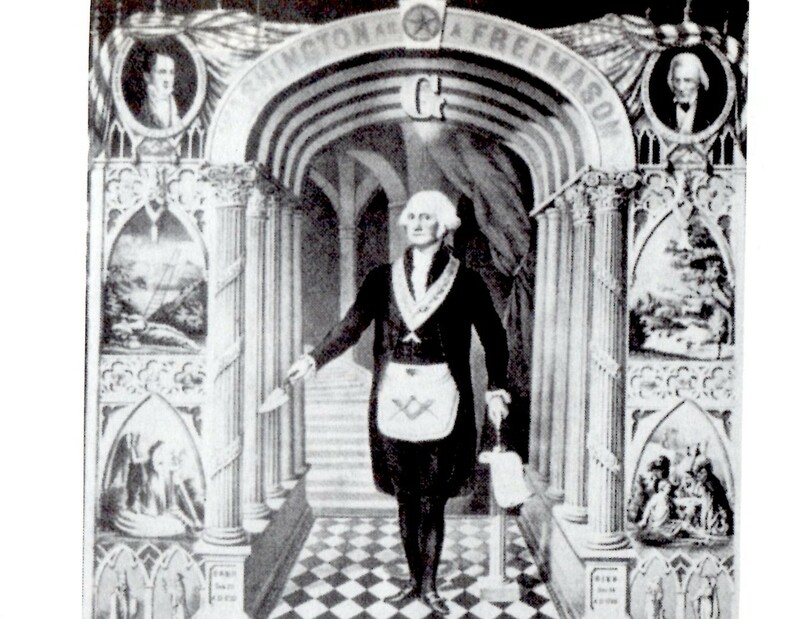 Posthumously, it denotes a new cycle of activity by others such as those who follow (or followed) the ideology and/or agenda of the native in question. 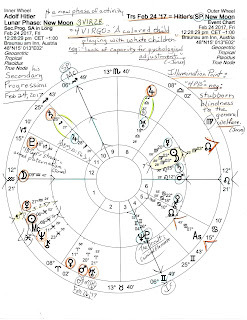 In addition to the NN (public contact; future direction) pointing directly toward Hitler's SP New Moon today are transits to his SP Jupiter and SP Uranus by Saturn and Jupiter, respectively. 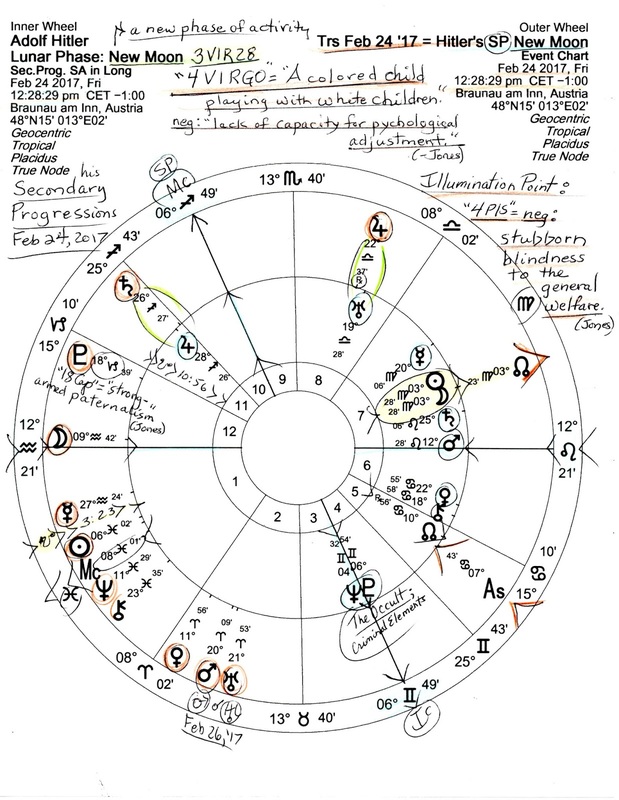 And since the Virgo-Pisces polarity (victim-savior) is intercepted, there is karma (reaping what's been sown) hidden in his SP chart--Virgo, the sign of purification and discrimination. His true heritage was hidden or unknown during his lifetime, perhaps, but it seems that Adolf himself had Jewish and 'brown' ancestry. See: Hitler Had Jewish and African Roots, DNA Tests Show. Ruh-roh! Unless this is 'fake news', aka, propaganda, we're not so very 'pure' after all, are we, Adolf? Well, few people are of one race these days! I've been learning from my genealogy research what a hodge-podge of genes I and my family are--along with most everyone else. 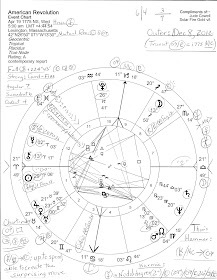 So in Hitler's Progressed chart, today's transits spotlight Jupiter Rx in Libra and Saturn in Sagittarius, the two societal planets while the Jupiter-Uranus combination suggests the political conflicts we're currently mired in these days especially those having to do with seizing power, ethnic cleansing ('purification'), racism (brown races vs white--see the Sabian Symbol, below), genetics (eugenics), wars and the subsequent migration of refugees, intolerance toward immigrants ('the other'), the erosion of civil liberties, mass murder, anti-semitism, Corporatism, Nationalism, Socialism, Neoliberalism, isolationism, neo-nazism, protectionism, statism, globalism and global government, and other problematic societal issues both in the news and otherwise. And naturally you know that underneath it all, the timely transit of gold-hoarding saboteur Pluto now creeping through Saturn-ruled Capricorn = the dictator (Ebertin)--and he's at the '18 Capricorn' "smug or strong-armed paternalism" degree of POLITICAL POWER (Jones). Apparently, the globalists' 'big picture' will come into sharper focus under a man known as Donald Trump. '4 Virgo': "A colored child playing with white children"...negative (shadow side/unconscious - jc) expression: lack of capacity for psychological adjustment. '4 Pisces' (Illumination Point): "Heavy traffic on a narrow isthmus"...negative expression: "stubborn blindness to the general welfare." Welcome to Trump Land a Max Igan broadcast (video-audio). And so I must assert that Astrology supports the evidence that it is fair to compare Donald Trump with Adolf Hitler, not because I prefer to, but because a fascist rise to power was missed or ignored in its early days when something could have been done to stop its atrocities and suffering and in 2017 must not be missed or ignored again. Hitler's Progressions show a 'new cycle of activity' beginning symbolically this very day, a beginning which is completely unwelcome from my personal common-good perspective. And planet Uranus, The Witness, says, Awake! But will you? 4 Virgo/Pisces: The Sabian Symbols in Astrology, Marc Edmund Jones.